Leading Manufacturer of cone funnel fabrication from Mumbai. Cone Funnel Introduction: Cone Funnel is a conical fabricated stainless steel component having a small whole or narrow tube at the apex and used to channel the flow of a substance like liquid or powder in, as into a small-mouthed, container commonly used pharmaceutical industries or packaging industries filling machines. This is a customize job of SS fabrication made from a Stainless Steel sheet and pipe. 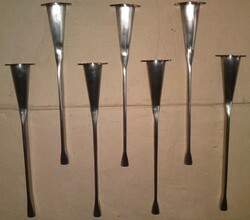 Cone Funnel Fabrication Size: Top cone part of funnel is made with (70mm x100mm) joining narrow bottom of (16mm dia. x 450mm Height ) and 20gauge thick stainless steel material or if it required customize size and need, it will be made as per new customize drawing and specification. Cone Funnel Fabrication Material: As Cone Funnel fabrication is a job of pharmaceutical machineries or food-processing machineries, it must be made with 316quality 1mm thick stainless steel food grade material. Cone Funnel Fabrication Detail: Showing picture of Cone funnel is a cone type funnel. As it was used as pharmaceutical machinery or food-processing machinery component, it was precisely made with the high-quality food grade 316quality SS materials. The Fabrication of Funnel is completed with a single joint of stainless steel sheet. The upper part of funnel is a cone, and lower narrow end is hollow and flat. The hollow flat shape is urged by manually pressing the round SS pipe. Upper cone part and lower bore is formed and joined each other by arc shape to allow material for easy flawing, which is impossible by machine. Finally inner sides of funnel given clear smooth mirrored finish for free flow of material and outer side is fabricated with disable joint with matted finish. Cone Funnel Application and Use: Cone Funnels were used in order to pouch packaging machine for filling the products like shampoo, powder, oil, mouth freshener etc. Looking for Cone Funnel Fabrication ?